With the launch of Sentosa’s Day Play Pass, Sentosa guests can now enjoy a convenient and affordable one-ticket system to experience up to 13 attractions on the island. Besides cost savings of up to 60 percent, this Day Play Pass also reduces potential queuing time at 13 predetermined attractions by up to two hours. This allows for greater flexibility and convenience for guests by allowing them to make changes to their itinerary after their purchase. These 13 attractions cover a whole range of activity types from the more sporty ones e.g. Segway Fun Ride, Gogreen bi-pedal cycling to more educational ones e.g. 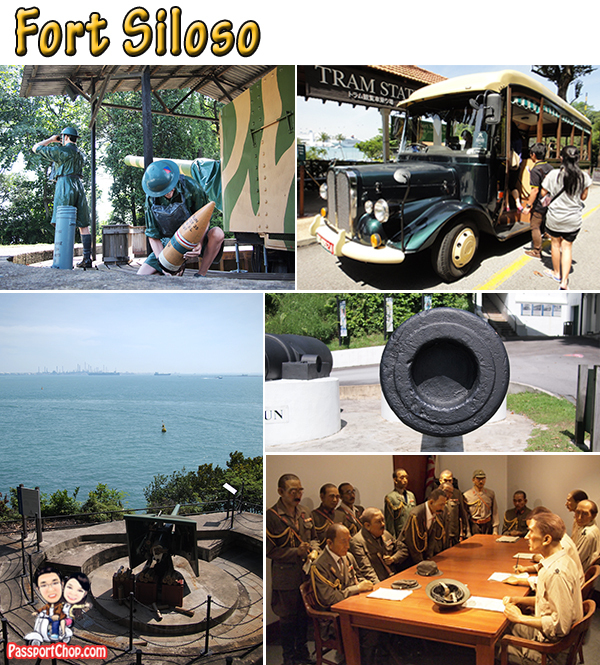 Images of Singapore, Fort Siloso. There are also award-winning popular attractions e.g. the trio of Sentosa 4D Magix, Sentosa Cineblast and Desperados. 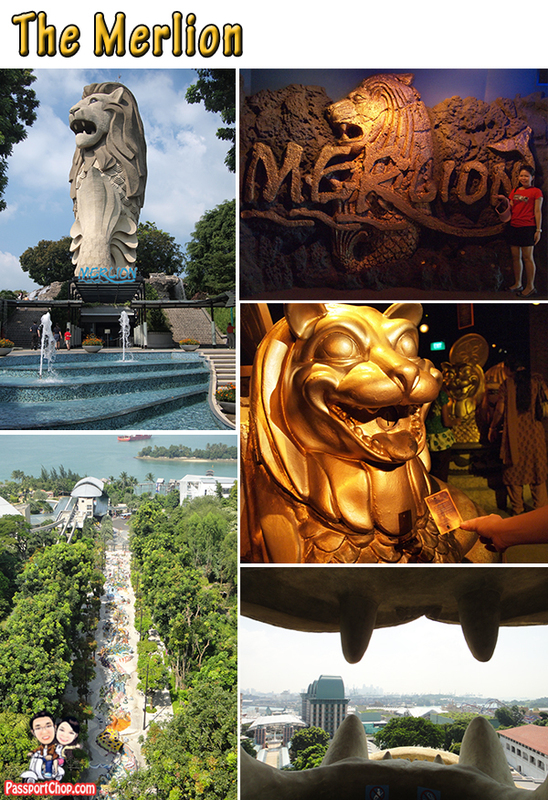 The following picture provides a summary of the attractions you can expect to see with the Sentosa Day Play Pass. The Day Play Pass cost $69.90 and $51.90 for Adult and Child respectively during weekends & public holidays (Cheaper rates available during weekdays) – definitely value for money considering that each of these attractions would have cost you about $15 and there is also the additional hassle of having to queue for your tickets. The Sentosa Day Play Pass also comes with a very useful map which you can use to plan your route around the island. We will be sharing with you our experience with the Day Play Pass and some tips on how to cover as much of the 13 attractions as possible without tiring yourself out. You will definitely need an early start if you intend to beat the crowds and fully utilise the benefits of this Pass. To avoid the hot afternoon weather and the weekend crowds that gather at the beaches and the roads that runs parallel to the beaches, you can consider starting off your Sentosa adventure with the Gogreen Bi-pedal Bicycle rental – rental for one hour is included in the Day Play Pass – the nearest Gogreen Bicycle rental booth is near the Beach Sentosa Express station. Alternatively, you can also start off with the Merlion (near Imbiah Sentosa Express station) which is one of the tallest structure on the island. You will start off with a tour of mythological sea creatures e.g. mermaid, dragons before a short viewing of Singapore’s history and the origins of Singapore’s symbol – the Merlion. There is even a chance for you to win something at the Merlion at a room full of Golden Merlions where you insert a Merlion coin (issued to you at the entrance) and the Merlion will spit out a card with instructions to redeem your mystery gift at the gift shop. The most common prize is a fan with – you guess it! – the Merlion face. Yes there is a strange sense of Merlion mania within the Merlion itself. From the top of the Merlion (the Merlion head), you can get great views of the Universal Studios and the beaches. The mouth of the Merlion offers a great photo opportunity with the fangs of the Merlion. Next, we proceeded to the Images of Singapore, just a 5-minute walk from the Merlion up the escalators which brought us to Imbiah lookout. 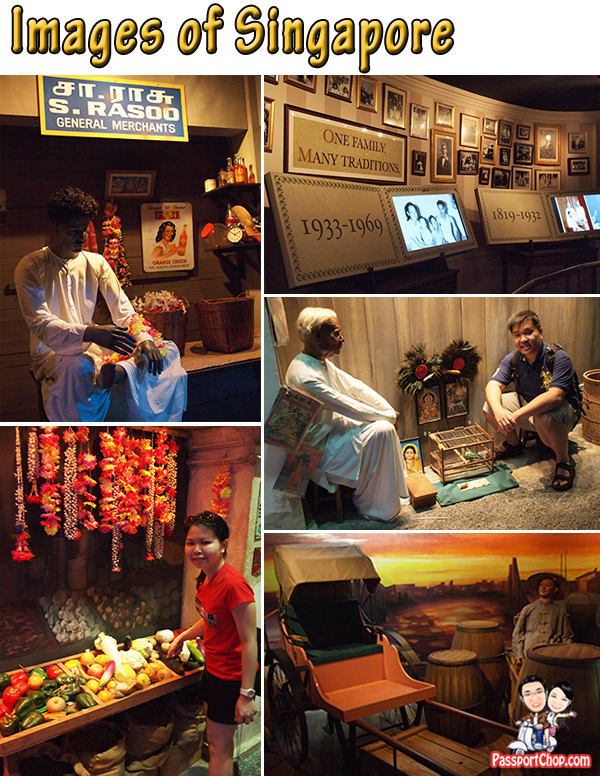 The Images of Singapore is one of the best places to learn about the history of Singapore with interactive displays and realistic wax mannequins to depict key periods during the development of Singapore. Besides history, it also showcases the customs of different religion groups in Singapore e.g. there were displays of wedding customs for the 3 key races – Malay, Chinese, Indian and various rites of life and religious holidays e.g. Chinese New Year, Thaipusam. The Butterfly Park and Insect Kingdom hosts a wide collection of different butterfly and insect species – there is an open area where butterflies are free to fly about and a closed museum section where all the creepy crawlies are exhibited. If you want to get up close with the birds, you can also choose to feed the birds (at a fee). If you are into nature, you can also consider taking up the guided tour of Sentosa’s floral and fauna at the Sentosa Nature Discovery (tour starts 2.30pm and 4.30pm). 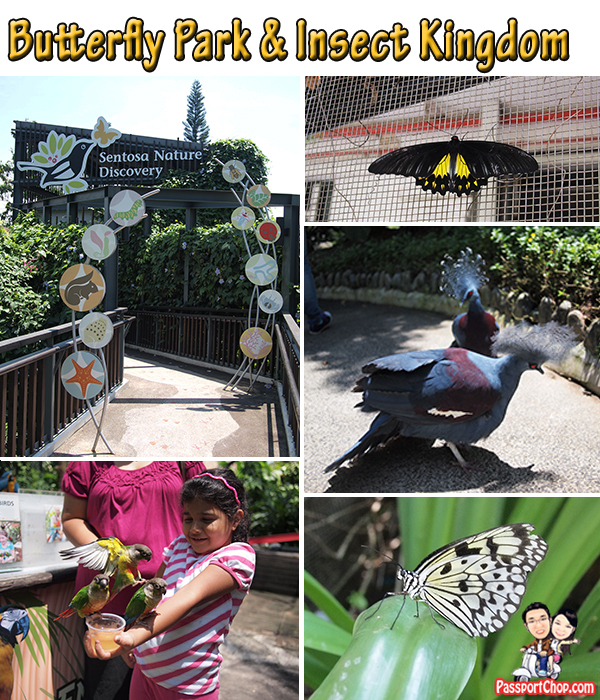 Entrance to both Butterfly Park and the Guided Tour at Sentosa Nature Discovery is included with the Sentosa Day Play Pass. Imbiah Lookout is where most of the attractions covered by the Sentosa Play Pass, are based. Images of Singapore, the Tiger Sky Tower, Butterfly Park & Insect Kingdom, Sentosa Nature Discovery, Sentosa 4D Magix, Sentosa Cineblast and Desperados are all located within 2-3 walking distance of each other. Thus there is no extensive planning needed to craft out an itinerary to fully tap on the benefits of the Sentosa Day Pass. Once we were done with the Imbiah Lookout attractions, we took the Luge down to the Beach area (Skyride and Luge included with the Sentosa Day Pass) where we then had lunch. For the convenience of guests who purchase the Day Play Pass, they will also have the option of buying the All-You-Can-Eat Pass. This combination entitles pass holders to dine at the two Tastes of Singapore outlets (Siloso and Imbiah) between 11am and 7pm and enjoy a variety of Asian and Western fare. For just $19.90 ($9.90 for child), you can enjoy yummy Starters e.g. Tastes of Singapore Chicken Wings, Potato Salad and Soup of the Day (you can order all 3 at once if you like – maximum of 3 items to be ordered at any 1 time) and Main Meals – can be Asian food – Singapore Chicken Rice or Nonya Prawn Laksa or Western food – Spaghetti Napoli or Both! (remember the 3 items at any 1 time rule?). Note that drinks are not included. After lunch, you can then take a quick spin around the Gogreen Segway circuit with the Segway Fun Ride (included in the Sentosa Day Play Pass) before hopping on the beach tram along Siloso Beach to the Flying Trapeze where you can try your hands at doing a Cirque du Soleil performance. If you had enough of swinging about and performing acrobatic moves at the Trapeze, you can then take a 5-minute walk over to the Fort Siloso. You will learn about the evolution of Sentosa Island from its purpose as a defender of Singapore’s seas and its ports to a recreational island. Most of the bunkers, tunnels and bomb shelters are still intact and you can get a sense of what’s it like as a British soldier during World War II. This is also where the famous wax replica of the surrender scenes (both the British to the Japanese at the beginning of the war and the Japanese to the Allied Command at the end of the war) is hosted. This also nicely wraps up the 13 Sentosa Attractions we covered with the Sentosa Day Play Pass in slightly less than 7 hours – a bit tiring but still quite an eye-opening experience. Guests are entitled to one visit per attraction with the Sentosa Play Pass. The Sentosa Day Play Pass is only valid from 9am to 7pm and island admission and transportation charges into Sentosa are not included. For guests who prefer to visit only specific attractions or plan to spend only half a day on the island, Sentosa also introduced the Noon Play Pass and Premium Play Pass. The Noon Play Pass allows guests to visit up to four attractions from a pre-determined list of 13, while the Premium Pass grants access to three from a list of six (which includes Wave House Flowrider, Jewel Cable Car Ride, Megazip, Segway Guided Eco Adventure). For more info on the Sentosa Day Play Pass, check out Sentosa’s Day Play Pass website. You can get your Sentosa Day Play Pass at any Sentosa ticketing counters or selected Transitlink Ticket Offices e.g. Orchard, Somerset, City Hall, Bugis, Chinatown, Changi Airport. Actually Singapore is one of my favorite place in terms of a vacation. I love to see more of a very beautiful spots their especially the merlion. Hello friend. I actually love that writing as well as your current web site all in all! Your posting is actually extremely clearly composed and effortlessly understandable. Your WP style is impressive as well! Would definitely be good to know where I are able download that. Be sure to keep up the excellent work. All of us require far more such web masters like you on the web and also much less spammers. Wonderful man! Sentosa island is so big that covering all the rides and attractions (even just the good ones) will take more than 2 days. A good buy to enjoy the island is the ‘Day Fun Pass’. But there is a catch! It looks like that the day fun pass includes 20 attractions, but actually within those 20 attractions there are many more fun things to do which are NOT covered in the pass.